Creation Date Friday, 18 July 2014. 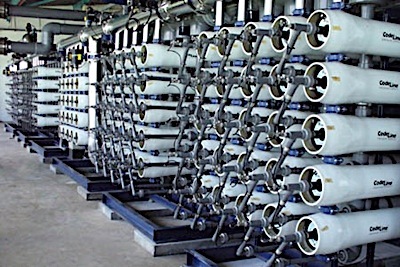 With this breakthrough RO system, Dow Water & Process Solutions has strengthened their mission to provide highly innovative demineralizing and desalination solutions in various industrial applications including industrial water treatment, power generation, food and beverage processing, municipal desalination and water reuse, as well as potable drinking water systems. On the recent research from the Pacific Institute, seawater desalination costs an average of 15,000 kilowatts per hour per million gallons (3.96 kWh/m3) of water produced, making it one of the most expensive water treatment processes today. The DW&PS has then developed DOW FILMTEC SEAMAXX elements based on energy efficiency and environmental sustainability in delivering filtered, desalinated water for various industrial and even residential uses at a lower cost. According to Felipe Pinto, DW&PS Americas Marketing Manager, “Turning seawater into high quality, usable water is a growing trend in the Caribbean to overcome the challenge of water scarcity and water shortages.” The DOW FILMTEC SEAMAXX elements offers an ideal and viable industrial water filtration solution for critical applications that require treatment of medium to high total dissolved solids, brine processing, and high salinity brackish water desalination. Industrial water purification applications require the use of high-quality laboratory water purification systems. Aqua Solutions offers advanced reverse osmosis pretreatment systems equipped with cost-efficient technologies capable of high production rates of 10-60 liters/hour and 1-2 gallons/minute in pre-filtering tap water prior to final purification by a DI system. Browse through Aqua Solutions’s full spectrum of reverse osmosis (RO) pre-treatment equipment, storage tanks, and accessories at www.aquaa.com/reverse-osmosis-ro-laboratory-water-purification-systems today.